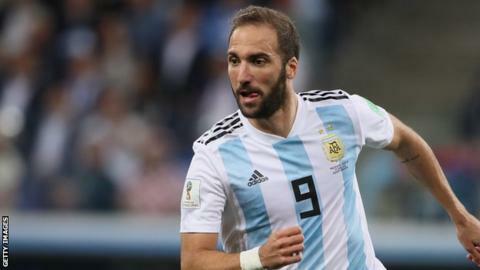 Chelsea striker Gonzalo Higuain says his retirement from international soccer with Argentina will be "to the joy of many people". Higuain, 31, won 75 caps for his country, scoring 31 goals, however has not featured since the 2018 World Cup. He was part of the Argentina teams that lost 3 major finals and has often been criticised for his performances in international soccer. "People remember the goals I missed and not those I scored," he said. "It's one thing to say that the national team didn't achieve our objectives, but when people talk about failure it's very hard." Higuain reached the finals of the 2014 world cup and also the Copa America in 2015 and 2016 with Argentina. He missed a superb chance in the 2014 World Cup final defeat to Germany and didn't convert a chance in normal time of the 2015 Copa America final loss against Chile before also missing in the penalty shootout. "The Premier League is superb and i really want to enjoy it. It's very competitive indeed."